A while back, I did a video review of the ATXRaspi R1, but I wanted to circle back and fill in a few details on how I used the "P5" connector, instead of the GPIO pins. But first I should mention that Felix reworked his circuit, replacing the relay with a power MOSFET, and dubbed it ATXRaspi R2. The (discontinued) R1 had an issue with some (whimpy!) power supplies. 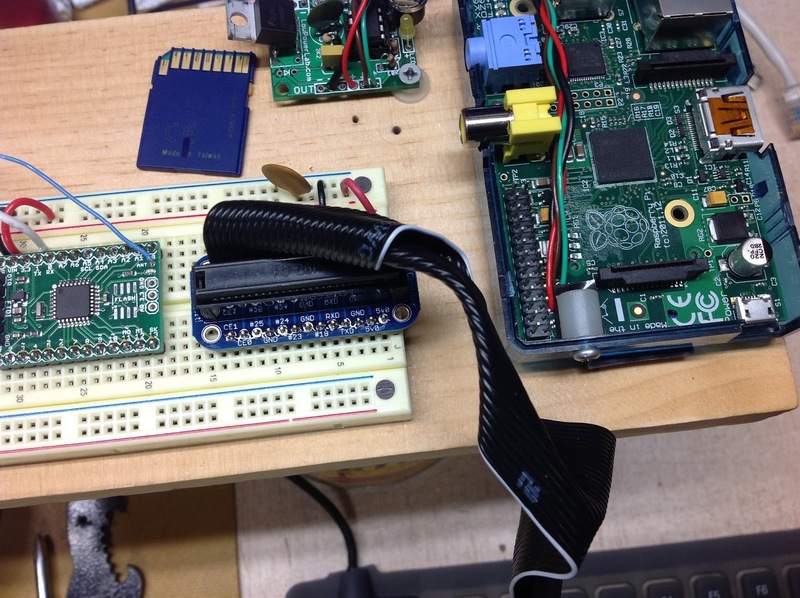 When the relay closed, the immediate current draw by the R-Pi would sometimes cause the ATXRaspi to reset. When/if this happened, you'd need to hold the power button for a second or two, the relay would click on/off/on a few times, and then everything was fine. The new ATXRaspi R2 completely solves that issue, by using a slightly slower turn on rate, via the MOSFET. On a related note, I posted a video about using power MOSFETs with Arduino or R-Pi, a while back. OK, back to those build details I wanted to share. I wanted to keep all GPIO pins open and available for other projects, Pi-Cobbler, etc. So my solution was to use the P5 connector on the Raspberry Model B, Rev.2. The P5 connector is "unpopulated" which simply means they didn't install the header pins. Which is fine by me, just made it easier to solder wires directly into the plated-through-holes. echo "(modified to use P5 on rev 2 Pi)"
echo "Setting P5-3 Input, Pull Down"
echo "Setting P5-4 Output, High"
echo "If/when P5-3 goes high, SYSTEM WILL HALT"
echo "Pin P5-3 is High: SYSTEM WILL NOW HALT"
By the way, Gordon's wiringPi library is excellent. Kudos to Gordon! I've been working with the Raspberry Pi, or R-Pi, for a couple months now, and figured it was high time I blog about it. As usual, my goal is to give you links and references that I found helpful, and to give you a few helpful nuggets that I learned the hard way, to save you time. For starters, I got the Raspberry Pi Model B Revision 2.0 (512MB) and a Transcend 16GB Class 10 SDHC Flash Memory Card (TS16GSDHC10E). 1) Make sure to get an SD card that is known to be R-Pi compatible: check this list. Don't waste your time on a card that others had trouble with. 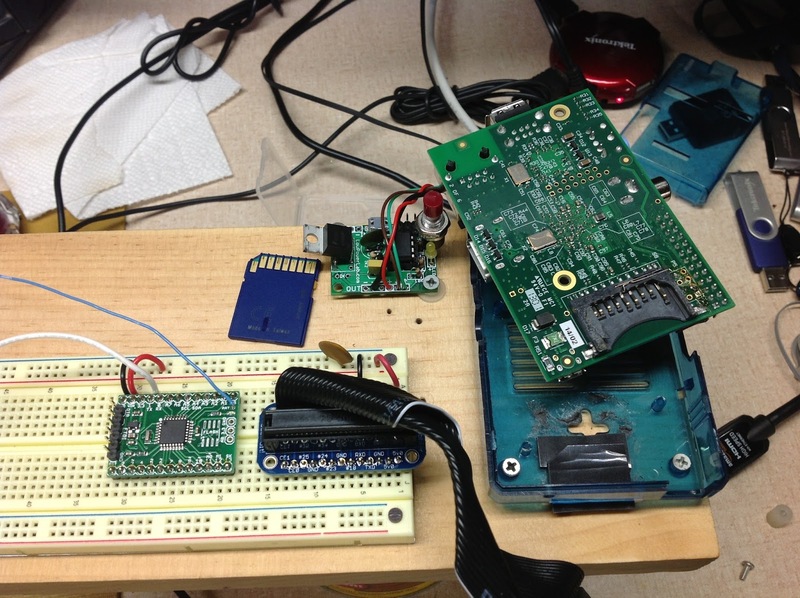 2) The SD card socket on R-Pi is very cheap and sooner or later it'll break. I thought I was being very careful, but I managed to break it, and it was a hassle to fix. 4) This Adafruit R-Pi case is a great value and works fine, except that it doesn't hold the R-Pi down very securely. One time I was unplugging the Pi-Cobbler from the GPIO pins and didn't realize the R-Pi was lifting up inside the case. The SD card was still plugged in, and that was the demise of the cheap plastic SD card socket. Now my SD card makes good contact again.